Social Sharing Tools are always preferred by Bloggers for Sharing their content on Different Social Networks. yesterday I explained about "How To Add ShareThis Social Share Widget to Blogger" , before that I had explained about "Add Splendid CSS Social Share Buttons for Blogger" and If you want to try Our Best Blogger Widgets then Try Here. Now Whats New in This ShareThis Slide Open Share Widget? Now would you like to Install it on your Blog? 4. Now After finding </head> copy the following code just above it. 6. After finding the </body> code just paste the following code just above / before it. 7. Now Click Save Template ! That's it, there is no need to change anything in above code. 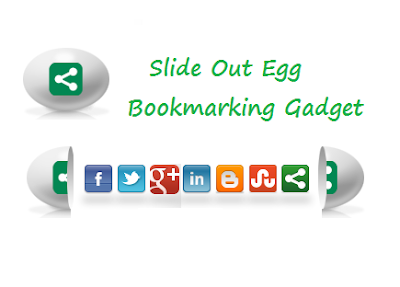 After doing everything as I mentioned above, go to your blog and see your Beautiful Egg ShareThis Slide Open Social Share Widget ! Hope above information must have found very helpful, don't forget to Subscribe Us by Email and Don't forget to add our Badge. You can also share this post with your friends ! if you have any problem just drop your comment below !